Property Outlaws puts forth the intriguingly counterintuitive proposition that, in the case of both tangible and intellectual property law, disobedience can often lead to an improvement in legal regulation. The authors argue that in property law there is a tension between the competing demands of stability and dynamism, but its tendency is to become static and fall out of step with the needs of society. 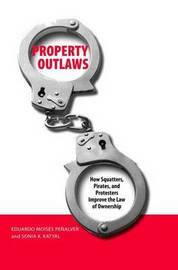 The authors employ wide-ranging examples of the behaviors of "property outlaws"-the trespasser, squatter, pirate, or file-sharer-to show how specific behaviors have induced legal innovation. They also delineate the similarities between the actions of property outlaws in the spheres of tangible and intellectual property. An important conclusion of the book is that a dynamic between the activities of "property outlaws" and legal innovation should be cultivated in order to maintain this avenue of legal reform. Eduardo Moises Penalver is a professor at the Cornell Law School. Sonia K. Katyal is a professor of law at Fordham Law School. .